January 15, 2005 Sandia, Texas – I have investigated the phenomenon of animal mutilations since 1979 and before he died, U. S. Army Lt. Col. Philip J. Corso told me that he had seen with his own eyes, during his work for the Eisenhower and Kennedy Administrations, highly classified documents about unusual and bloodless animal deaths around the world dated as early as 1951. That would be only four years after the Roswell, New Mexico, headlines about an unidentified flying disc that had crashed near Corona. –12/10/2004 – Part 4: “Peculiar Phenomena,” V-2 Rockets – and UFOB Retaliation? -05/16/2004 – Part 8: UFO Crash/Retrievals: Status Report VI © July 1991 by Leonard H. Stringfield. -03/17/2004 – Part 2 – “Horrible Secret,” UFO Crash Retrievals Near Roswell, New Mexico, July 1947? And the animal mutilations continue worldwide to date. On January 5th, James Lund was traveling with his nephew, Chris, near Sandia, Texas, northwest of Corpus Christi. Mr. Lund owns a direct satellite installation company called Exodus Communications Co. and was making repairs. The men were on Route 359 just south of Sandia when Chris noticed a cow down in the pasture about 150 yards from the road. The ranch’s owner is still unknown and no necropsies were done under rancher’s or Jim Wells County Sheriff’s requests, but I talked with James Lund this week about why the cow lying there looked so strange to them. It also had all its reproductive organs were removed. The eyes were removed. The tongue and teeth were removed. They had some strange cuts in the forearms. They had circular cuts as well, maybe two inches in diameter. They looked like they were cut out with a really sharp cookie cutter or something. 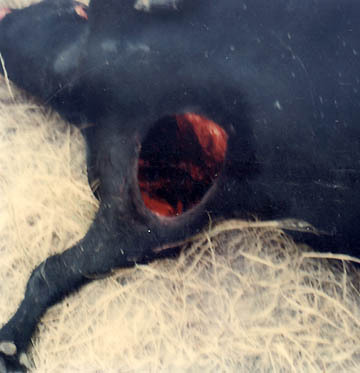 They were also cauterized as they went in because there wasn’t a drop of blood anywhere near or on this animal.